Let me start this review off by saying the Terese Mailhot is a sensational writer. 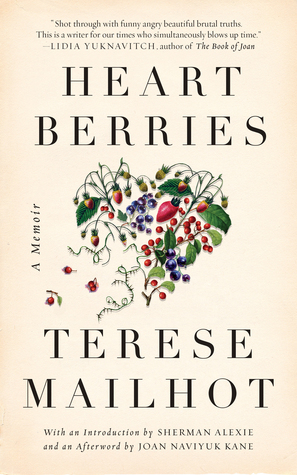 “Heart Berries” is a raw, personal account of Mailhot’s life and experiences as a First Nations woman who has witnessed abuse, poverty, addiction, as well as generations of family members who have passed through Canada’s brutal residential school system, which separated indigenous children from their families and, in many cases, subjected them to sexual and physical abuse. Mailhot talks about this and a myriad of other topics in her writing, often taking on the form of missives to former lovers. There were definitely moments in this book where I found myself underlining passages in my Kindle, saying “yes!” But then these flashes of brilliance would signal the moment when the magic would end, because moments later the author would switch time, location, and subject without warning. I am a bit confused with the classification of this book as a memoir, because the selections together as a whole seemed terribly disjointed and didn’t tell a cohesive story. The lack of cohesion put up a barrier for me–I wanted to understand her and the writing was certainly drawing me in, but the lack of a solid story here made this something I couldn’t access. I almost feel bad for giving this two stars, because this book has gotten glowing reviews in the mainstream press. I definitely like the way the author writes, but I just don’t think this is my kinda book. I’ve been so curious about this one, sometimes I like kind of non-linear storytelling but not if it’s confusing. Good to see a different perspective on this, I’d only read glowing reviews so far.